FSX/P3D 3 & 4 Boeing 787-9 Air New Zealand package with new enhanced VC. Air New Zealand currently (July 2017) operate 9 Boeing 787-9 aircraft with a further 4 on order. The high detail native FSX Boeing 787-9 from TDS will be enjoyed by many more people who do not know how to install a VC into a FSX native model. The VC is the Alejandro Rojas Lucena/FSND fantastic revised Boeing 737-800 VC model blended with Ken Wiggington's revisions for the default B737 VC to make it more resemble a 787. This VC model includes Working wipers (right mouse click on switch) with rain effect. Switches for LCD Screens, EICAS, PFD, MFT. Autobrake switch. Opening pilots window. Cabin Lights switch. Realistic FMC. Ground Proximity Warning System (GPWS), More Realistic night VC textures. There are custom Boeing sounds included for that extra realism. I added the great photoreal textures by Guilo Cattaneo. Model is not modified in any way. The VC added and aircraft.cfg edited to allow correct VC views. Native FSX Boeing 787-9 model by TDS. See VC docs to get the best out of the VC and FMC. Assembled and prepared for P3D 3 & 4 & FSX by Chris Evans. FSX/P3D 3&4 Boeing 787-8 Hainan Airlines package with new enhanced VC. Hainan Airlines is China's 4th largest airline in fleet size and currently (July 2017) operate 10 Boeing 787-8 aircraft. The wonderful Boeing 787-8 from TDS will be enjoyed by many more people who do not know how to install a VC into a FSX native model. The VC is the Alejandro Rojas Lucena/FSND fantastic revised Boeing 737-800 VC model blended with Ken Wiggington's work on the default 737 VC to make it more resemble a 787. This VC model includes Working wipers (right mouse click on switch) with rain effect. Switches for LCD Screens, EICAS, PFD, MFT. Autobrake switch. Opening pilots window. Cabin Lights switch. Realistic FMC. Ground Proximity Warning System (GPWS), More Realistic night VC textures. There are custom Boeing sounds included for that extra realism. I added the great textures by Dietmar Hann. Assembled, edited and prepared for Prepar3D V3 & 4 & FSX by Chris Evans. P3D 3/4 / FSX Native Boeing 767-300F Freighter JAL Cargo Silver Bullet package with Advanced VC. Complete package for FSX/P3D 3 & 4 Boeing 767-300F in JAL Cargo Silver Bullet livery. JAL Cargo ended operations in October 2010 and did operate this beautiful 'Silver Bullet' livery. The wonderful creation from Project Opensky will be enjoyed by many more people who do not know how to install a VC, views, exits, Utilities etc into a FSX native model. So now this 767-300 has the nearest VC I can find -- the 737-800. The layout fof the 767 cockpit is not a million miles away from the advanced 737-800. The VC is the Alejandro Rojas Lucena/FSND fantastic revised Boeing 737-800 VC model. This VC model includes Working wipers (right mouse click on switch) with rain effect. Switches for LCD Screens, EICAS, PFD, MFT. Autobrake switch. Opening pilots window. Cabin Lights switch. Realistic FMC. Ground Proximity Warning System (GPWS), More Realistic night VC textures. There are custom Boeing sounds included for that extra realism. Jetways also edited (Ctrl j). I have added the high quality textures from Yosuke Ube. Also added 767 sounds for more realism. Model is not modified in any way. Aircraft.cfg edited to allow correct VC views. Skyspirit wonderful native FSX Boeing 767-300F models. See VC docs to get the best out of the VC and FMC. Enhanced VC added for FSX by Chris Evans. FSX/P3D 3 & 4 Boeing 747-8i Luthansa D-ABYK package with enhanced VC. Hi reflection textures. Currently (July 2017) Lufthansa operate 34 Boeing 747-8i. The Boeing 747-8 Intercontinental can carry over 400 passengers at a speed of 1055km/h or 570 knots (656mph). Skyspirit FSX Native Boeing 747-8i assembled and upgraded for Prepar3D 3 & 4 + FSX with the developed B747 VC (virtual 3d cockpit) from Alejandro Rojas Lucenda (Manual included). This is the Project Opensky FSX native Boeing 747-8i GenX model, and includes ground cargo servicing, stairs (FSX - Go to Views - Instrument Panel -Posky Utility), opening nose section and more. Included CF engine sounds from BrandonG, with realistic jet whine to make your flight sound great. Thank you to Skyspirit/Project Opensky for their outstanding donations to the worldwide community of flight simulation. I have included the great textures by ReflectionS. Also includes the Boeing 747 VC textures upgrade. This give a much clearer 747 interior virtual cockpit look. Assembled and edited for FSX/P3D by Chris Evans. FSX/P3D 3 & 4 Native McDonnell Douglas MD-83 Series Multipack 4. 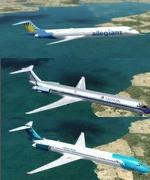 Liveries included: Spanair, Allegiant Air, Mexicana, Eastern. This is the native SGA MD83 converted by Eagle Rotorcraft Simulations of the Eric Cantu/SGA original. Native model by Eric Cantu/ Eagle Rotorcraft Simulations. The VC is default FSX CRJ 700 with added FMC by Garret Smith. I have added the great textures by Xudeva Irribarra, John Newman, Dan Halpern. Model is not modified in any way. VC added and textures. Fixed wheel sink. Views fixed to fit CRJ700 VC. See VC docs to get the best out of the FMC. Assembled and prepared and tested for P3D V3 & 4 /FSX by Chris Evans. FSX/P3D V3 (Not V4) Airbus A321-200 Wow Air. FSX/Prepar3D V3 & 4 Boeing 737-700 Southwest Airlines Missouri One Package with enhanced VC. Southwest currently (2017) have over 500 Boeing 737-700 in operation and are the largest operator of the Boeing 737 series. Many are painted in special liveries such as this Missouri 1. FSX native model by TDS/ Tenkuu Developers Studio with advanced 737-800 VC added. Includes utility for ground services, Passenger bus, cargo, stairs, refuelling truck etc (find it under - Views - Instrument panel - Util) The wonderful Boeing 737-700 from TDS will be enjoyed by many more people now, assembled in one ready tested and ready to fly package. The VC is the Alejandro Rojas Lucena/FSND fantastic revised Boeing 737-800 VC model. This VC model includes Working wipers (right mouse click on switch) with rain effect. Switches for LCD Screens, EICAS, PFD, MFT. Autobrake switch. Opening pilots window. Cabin Lights switch. Realistic FMC. Ground Proximity Warning System (GPWS), More Realistic night VC textures. There are custom Boeing sounds included for that extra realism. I have added the great textures by Nathan Rusdianto. Model is not modified in any way. VC added and aircraft.cfg edited to allow correct VC views. TDS wonderful native FSX Boeing 737-700 model. See VC docs to get the best out of the VC and FMC. Assembled and prepared for FSX/P3D by Chris Evans. P3D V3 & 4/ FSX Boeing 777X (777-9) Turkish Airlines package. Turkish already operate 33 B777-300 and it is quite likely in time that they will order the new Boeing 777-x. The VC is the Alejandro Rojas Lucena/FSND fantastic revised Boeing 737-800 VC model blended with Ken Wiggington's work on the default 737 VC to make it more resemble a 787 and possibly the new 777-9X! This VC model includes Working wipers (right mouse click on switch) with rain effect. Switches for LCD Screens, EICAS, PFD, MFT. Autobrake switch. Opening pilots window. Cabin Lights switch. Realistic FMC. Ground Proximity Warning System (GPWS), More Realistic night VC textures. There are custom Boeing sounds included for that extra realism. The great native FSX Skyspirit model features opening doors & cargo doors, detailed textures, accurate paint, dynamic shine & effects, dynamic flexing wings that respond to turbulence, fully independent suspension, trim animation, gear steering, accurate flight dynamics, spoiler animation, reflective cockpit windows, crash effects, animated tilting bogies, full night lighting, stairs, ground service vehicles when cargo doors open, (FSX - Go to Views - Instrument Panel -Posky Util), detailed virtual cockpit and more. Added custom B777 sounds. To use FMC - Go to Views - Intrument panel - FMC. See FMC docs. Fantastic native FSX model by Skyspirit/Project Opensky. Jetway exits and wheel sink fixed. I have included the fine textures by Ricardo_tv. Zip preview for images. Prepared, tested and assembled for FSX P3D v 3 & 4 by Chris Evans.